We are a friendly, efficient family-owned business with over 30 years of electrical experience. Our services cater to an extensive range of residential and commercial needs to suit all budgets. 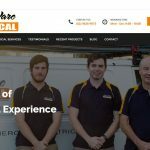 We will take time to understand your needs and our helpful electricians will explain everything so that you fully understand all aspects of your job before we start. We accept payment by cash, cheque or direct BPAY transfer. Feel free to contact us about any of your electrical needs.